Can you guess what this microscopic picture is? Here are a few hints; it’s native to North America, plays an important role in many natural processes, and can be considered a sign of good luck or good fortune. Still no clue? Here is a picture of the same subject on a regular scale. If you guessed that it was some sort of plant, then congrats! But do you know exactly what kind of plant this is? 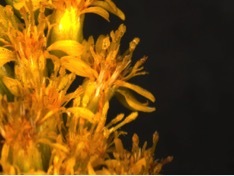 The plant in this picture is part of the genus Solidago, more commonly known as goldenrod. 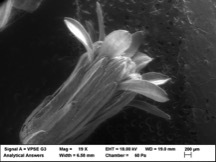 In other words, this is a microscopic picture of a weed. 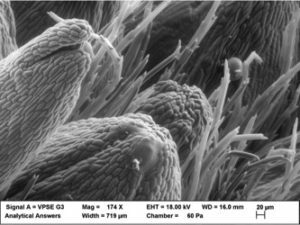 You might be wondering why we took the time to run microscopic scans of what is essentially the pesky plant version of a tumor that everyone takes extensive measures to keep out of their lawns. But goldenrod is actually highly misunderstood and carries a bad, not to mention false, reputation. Although goldenrod is considered a weed in many regions in North America, it is actually just a harmless wildflower that is also the state flower of Kentucky and Nebraska. In Europe, goldenrod is considered a precious garden flower, and has also become common to the wild. In other regions, it is considered a sign of good luck. Many people believe that goldenrod causes hay fever in humans, but this is entirely false. Goldenrod inaccurately receives the blame for hay fever, when it is really ragweed that causes this, which just so happens to bloom around the same time as goldenrod. 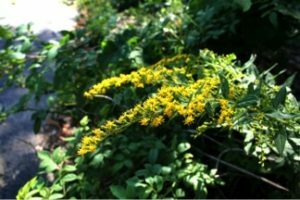 Although excessive handling of goldenrod can sometimes cause an allergic reaction, goldenrod is not linked to any typical allergies nor to hay fever. Actually, the pollen from goldenrod is too heavy to be blown by the wind, and it has to be pollinated mainly by insects. Honey from goldenrods is often dark and strong, and can sometimes have a spicy taste. Young goldenrod leaves are edible, and can also be used for herbal teas; the Native Americans used the seeds of goldenrod as food. Still not convinced of the harmless, beneficial nature of this wildflower? Well how about the industrial uses of goldenrod, which includes being used for rubber in the tires of Model T Fords? Thomas Edison created a cultivation process that maximized the rubber content in goldenrod in order to produce plants that were 12 feet tall and up to 12% rubber. Henry Ford, who was dedicated to finding regenerative properties and alternative crops for materials for his cars, used goldenrod rubber for the tires in the Model T Ford that he gave to Edison as a gift. Later on, during World War II, extensive research and development was conducted to commercialize goldenrod as a source of rubber. 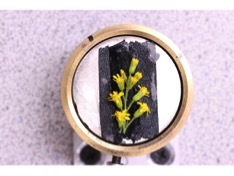 In addition to industrial uses, goldenrod has numerous medicinal uses. Historically, goldenrod was typically applied to the skin to help heal wounds and prevent infections, and Native Americans chewed on the leaves to relieve sore throats or toothaches. Goldenrod has been used to treat tuberculosis, diabetes, asthma, arthritis, and much more. Animal studies have shown that goldenrod can help reduce inflammation, relieve muscle spasms, fight infections and even lower blood pressure. With all of these beneficial side affects, it’s hard to deny the magical, medicinal powers of goldenrod. Although many Americans consider goldenrod to be an annoying weed, it is actually a lovely wildflower with many practical, medicinal uses. Not only can goldenrod be used for rubber in car tires, but it can also help prevent infections and reduce inflammations. Not to mention, goldenrod does not cause allergies or hay fever. So, did all this information help to break the stigma about goldenrod? Hopefully it did!